Of all the resources that hang in the balance as firefighters attempt to slow the growth of the Eagle Creek Fire, one stands out: the Bull Run watershed. It’s 150 square miles of hemlock, fir and cedar trees just south of the Columbia River Gorge. The forest soaks up rain and fills the lakes and reservoirs that provide drinking water for close to 1 million people in Portland, Gresham, Beaverton and Tigard. 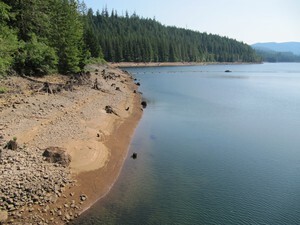 The watershed is part of the Mount Hood National Forest. It’s protected by special legislation that limits logging, hiking and most human activities to avoid contaminating the water. On a map, the boundaries of the Bull Run are shaped like a triangle, with its tip pointing at the Columbia Gorge. As of Thursday, the perimeter of the Eagle Creek Fire looked a little like a claw reaching for the Bull Run. 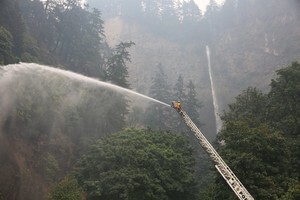 Campbell said the fire is without question the most serious threat to Portland’s drinking water supply in many years. Fire managers said Thursday they were allocating additional crews and resources to help protect the Bull Run. They’ve identified a Bonneville Power line on the northwest edge of the watershed and some old roads that could serve as a fire line if needed and a small lake in the watershed where helicopters can fill up buckets of water to drop on the fire. “We are allowing helicopters to draw water from Blue Lake. It is not a body of water that we supply to you as customers,” said Nicole Adams, a bureau spokeswoman. 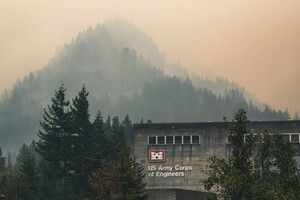 More controversially, Campbell said the bureau has authorized the U.S. Forest Service to drop fire retardant in the watershed if necessary. “The current circumstances are such that we do not in any way want to provide any restrictions in the set of tools that the firefighters have,” he said. The retardant is fertilizers, made of ammonium compounds mixed with water, which can form a combustion barrier between fire and vegetation. — and for the harm retardants can cause to fish populations. In 2011, the agency agreed to direct firefighting pilots not to drop the stuff within 300 feet of waterways. 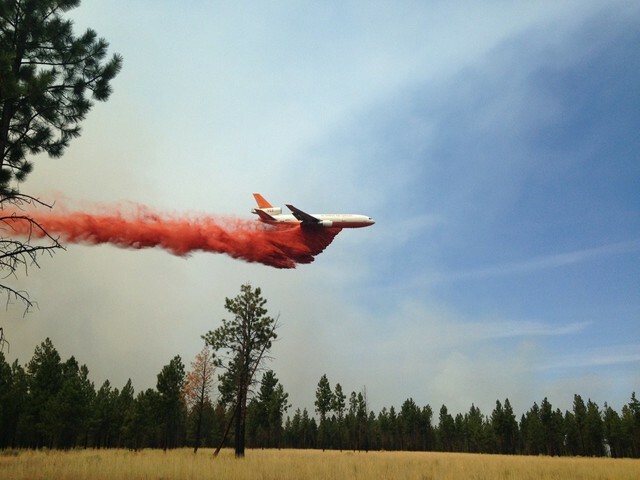 Firefighters have yet to actually use retardant in the Bull Run, Campbell said. If that does happen, the Water Bureau will test for any impacts to water quality. “The types of issues we’d be looking at are the same you would find from a discharge of fertilizer into an area,” he said. The Bull Run has provided Portland with abundant, pristine and affordable drinking water for more than a century. 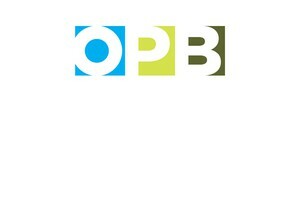 It’s a point of pride for many Portlanders. 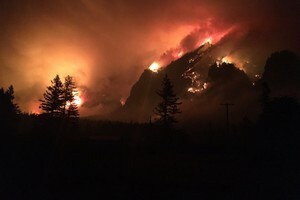 The water supply is also uniquely vulnerable to a large fire. The banks of Reservoir 1 in the Bull Run Watershed. The Eagle Creek Fire was burning less than 5 miles from Bull Run Reservoir 1 as of Thursday, Sept. 7, 2017. 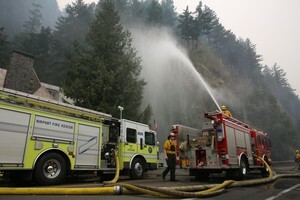 In fact, the risk posed by a large fire that could burn the Bull Run forest canopy was among the factors that drove the Portland City Council earlier this summer to approve a plan to build a new $500 million filtration plant. But that plant won’t be built for a decade, at least. In the meantime, Campbell and the bureau face a 30,000-acre fire at the watershed’s doorstep. Still, he — and the nearly 1-in-4 Oregonians who rely on the Bull Run for their tap water — might get lucky this time. This weekend, the forecast is calling for cooler temperatures — and maybe even a little rain.